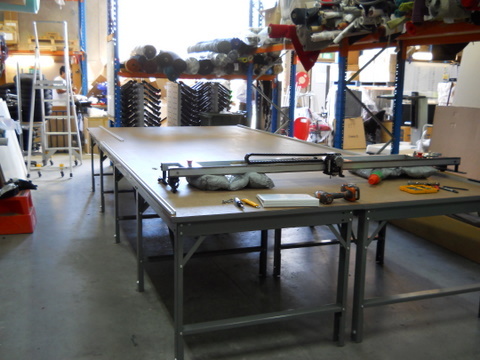 In December 2011, Carlson Design was invited to Perth, Western Australia to install a PT-84″ Plotter/Cutter on a 28′ long phillocraft vacuum table to plot/cut office furniture at Advanata. For the past 25 years, Advanta has been one of Australia’s leading suppliers for office furniture — known for their quality and customer service. 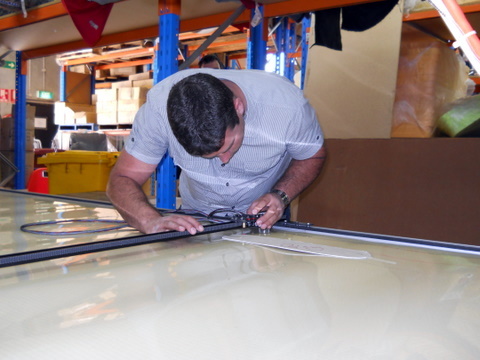 Their primary driver behind purchasing a digitizing/plotting/cutting system is to produce more accurate, repeatable patterns, more quickly and with less material waste. OK – before we walk you through their install, here’s a quick look at the final product. *Spoiler alert: It’s awesome. They are going to use our T-Bar Digitizer to trace years of physical patterns and create digital, ready-to-cut files (picture of pattern library later in the post). The T-Bar rides on the same track and table as the cutter, allowing you to trace patterns as large as your cutting bed. You can see Josh digitize his first pattern and then plot and cut using the PT-84 in under 5 minutes: http://vimeo.com/34858726 (This video was shot in HD, for the best viewing experience, please give it a minute to load). Before we arrive they loosely assembled their table frame. This time saving trick means more time for training! 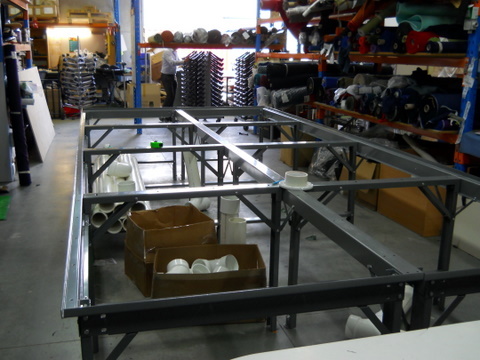 Once the frame is assembled, position your table where you want it. Insert the vacuum table tops and align the edges. 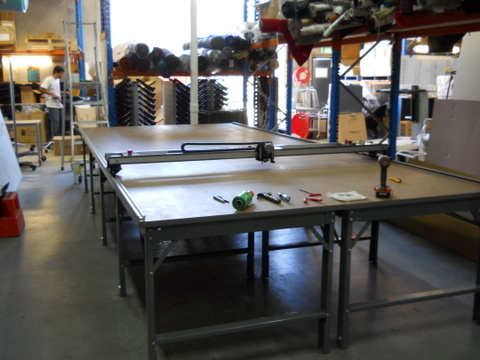 You are now ready to square, level, and tighten the table frame. Attach the first side of your plotter/cutter track. Follow instructions -- it is import that the track is as straight as possible. 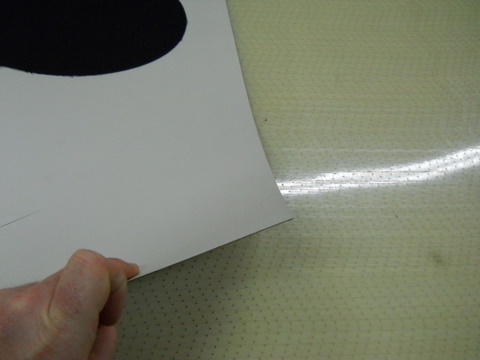 Use the plotter/cutter as a guide to attach track on the other side. 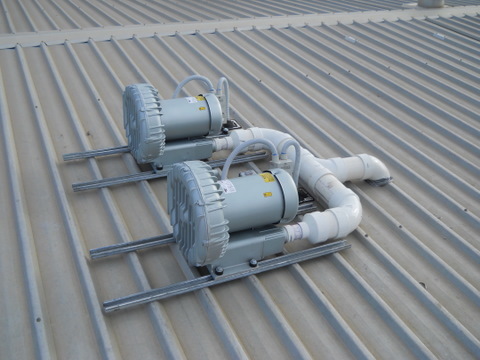 Before we arrived, they also mounted the two, 5HP regenerative vacuum blowers on the roof. Advanta is cutting polyester, wool, and vinyl. 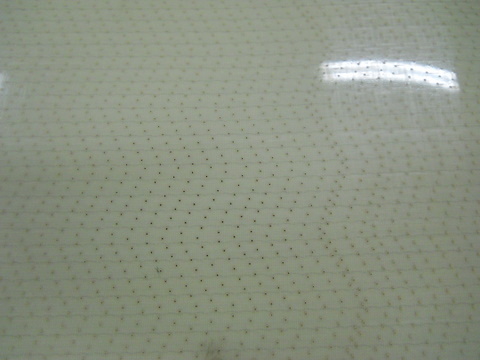 The majority of their material is a high thread count, porous material. Therefore, we sized two 5HP regenerative blowers. 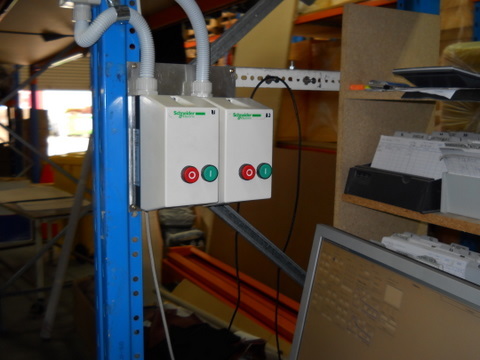 These are plumbed in parallel (in the photograph) and mounted on the roof, about 30 meters from the table, although a closer mounting would reduce losses. They will remain outside for noise reduction/cancellation. Regenerative blowers are a little more expensive, but a great choice if you need a lot of suction. 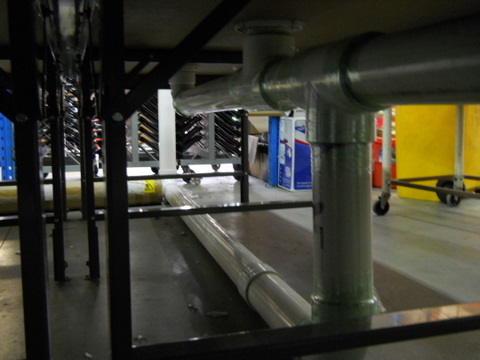 They have around 30 meters of plumbing running from their vacuum blowers on the roof to the bottom of the vacuum table. It is important to check every joint and connection for leaks to prevent vacuum loss. Plumbing runs to the center of the table. Add blast gates to create different vacuum zones. 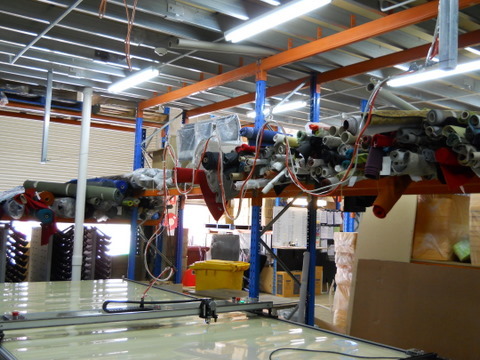 They setup each motor with its own starter. 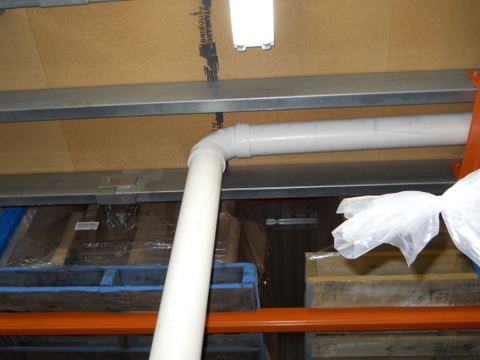 You can use one or both blowers depending on your table coverage and material density. Add cutting surface to table. Run Overhead Cabling. Make sure you use a nice "sailing-hardware" grade pulley for your lead over-head cable pulley. Time to start digitizing that enormous hard pattern library. Phil digitizes his first pattern. The T-Bar has two buttons to allow the operator to digitize plot and cut lines. Now it’s time to start training. Everyone pull up a chair…and they had some great chairs! "Take a seat, please." 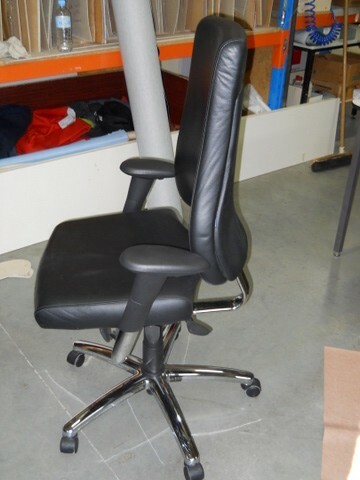 They make great looking chairs like this one. You may notice their cutting surface looks a little different. 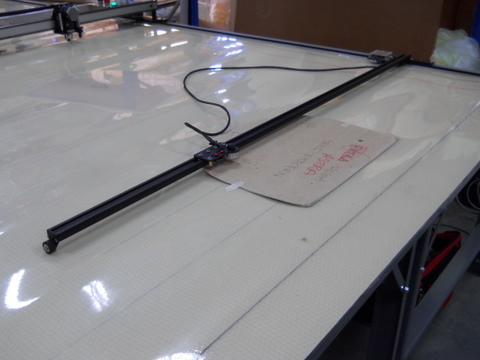 In an effort to eliminate material hangers caused when a rolling blade hits a vacuum hole, they went with a laser drilled, mircro-perferated cutting surface. Unfortunately, the high thread count nature of their material and the soft nature of the cutting surface resulted in the blade rolling over the material without fully cutting. The solution is a combination of a harder cutting surface or something between the cloth and cutting surface like butcher paper. Cutting is improved with very high thread count materials by putting paper between the cloth and cutting surface. 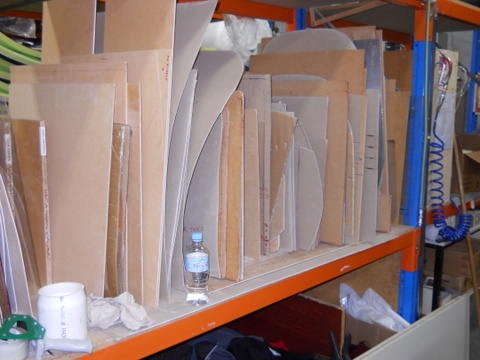 Harder cutting surface like Polyethylene or Formica. It’s a long journey to Western Australia, however the staff at Advanta made us feel at home, “down-under”. We think this is a great application for our equipment and look forward to watching their success. 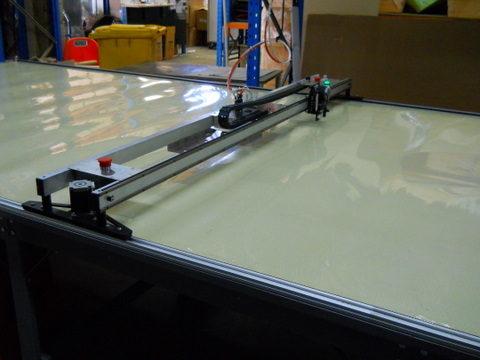 For more information about how to automate your cutting, please contact us at info@carlsondesign.com.